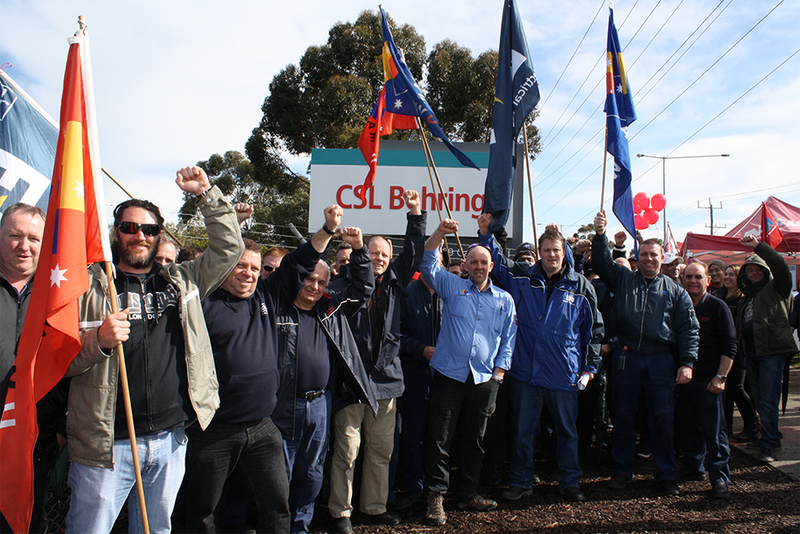 More than 200 CSL workers and AMWU members gathered outside the main Victorian plant on Tuesday to protest against the company’s decision to cut conditions and allowances despite its stunning $1.89 billion profit in the past year, which was revealed to the stock exchange hours earlier. The pharmaceutical giant’s offer, which union delegates described as “the worst offer in CSL’s history”, has prompted AMWU members to stop work for four-hour periods at both CSL sites and to impose bans on paperwork and overtime in protected action over the past week. AMWU members demanded that the company recognise their crucial part in its massive profitability, encouraging colleagues not taking part in the four-hour stoppage to “vote down” a company deal including a pay offer over three years which falls “dramatically short” of its 5.5% net profit growth for 2015-16. The union’s Victorian Assistant Secretary Craig Kelly said workers were left frustrated by the management’s “belligerent and antagonistic attitude”, which had dragged bargaining talks out since March. “It is high-skill, vital work for public health that everyone here is doing, at the high-end of science and technology,” he told union members. He said members were prepared to rollover most aspects of their existing agreement and only demanded a modest increase to overall take-home pay which would reflect their contribution in real terms. “But CSL refuses to talk beyond a wage rise that freezes allowances for meals, cold-room work, emergency response and laboratory clothing at existing levels for three years,” the AMWU said. AMWU delegate Shannon Brooks said this would reflect badly on lab and maintenance workers, many of whom relied on updated allowances to keep pace with rising household bills and food prices. “The allowances are important, a decent pay rise is important and we know from CSL’s profit result today that it certainly won’t send the company broke,” he said. 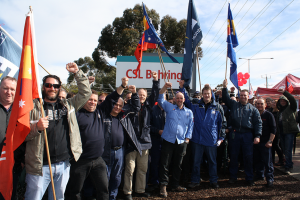 AMWU members’ action was supported by fellow CSL unionists, members of the Electrical Trades Union (ETU), the Community and Public Sector Union (CPSU) and the National Union of Workers (NUW).